We are a leading Manufacturer of party wear saree, party wear ladies saree, party wear silk saree and party wear border saree from Surat, India. To net propelling demands of our esteemed clients, we are offering a vast spectrum of Party Wear Saree. The offered sarees are designed using optimum quality fabric that gives an excellent finish to the entire range. Imparts a captivating look to the wearer, our qualitative sarees are widely demanded among our clients due to their remarkable features. The offered sarees are made available in different designs, alluring patterns and vivid colors. Empowered by the usage of contemporary technology, we are offering a wide assortment of Party Wear Ladies Saree to our esteemed clients. Our offered sarees are appreciated for their unique patterns, splendid designs and perfect finish that positions our products far ahead of the competitors. These sarees are widely demanded to be worn in functions, parties and festivals and broadly demanded by our clients due to their unique features. Our skilled designers only utilize quality assured fabric and sophisticated technology. We are instrumental in offering a wide range of Party Wear Silk Saree to our reliable clients. 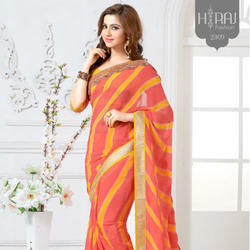 These sarees are offered in brilliant design, nice-looking pattern and other specific features. Further, our offered sarees are appreciated in the market due to their salient features such as shrink resistance and mesmerizing design. Moreover, our sarees can be purchased by our clients at industry leading rates within promised time-frame. Being a quality-centric organization, we are offering a vast spectrum of Party Wear Border Saree that imparts a captivating look to the wearer. The offered sarees are acknowledged for their exquisite design and beautiful pattern. Our qualitative sarees are extensively demanded all over the world. These sarees are crafted by our skilled professionals with utmost care using quality assured fabric and latest technology. Further, provided sarees are tested on various quality parameters to ensure that we deliver defect free range to our clients.